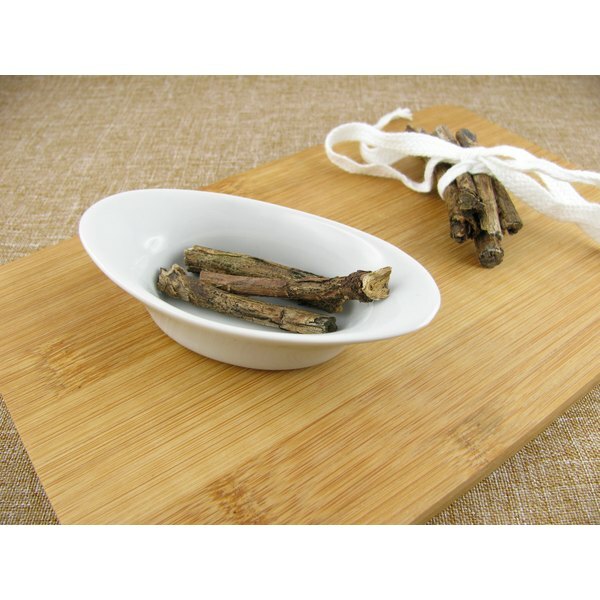 Licorice root has been used for centuries to soothe and relieve coughing and various other ailments affecting the respiratory and digestive tracts. The sweet herb makes an excellent tea that relieves tickling and itching in the throat and upper chest that is often the trigger for coughing. Licorice root can produce significant side effects, so use it only under the supervision of your health practitioner. Licorice root, or Glycyrrhiza glabra, contains compounds that make it more than 50 times sweeter than sugar, honey and other natural sweeteners. Traditionally it is used to soothe colds, sore throats, coughing and digestive upsets. It acts as a demulcent, which means it coats the throat with a thin film of mucilage, or mucous, protecting delicate tissues. Additionally it is used as an expectorant to clear congestion from the lungs and bronchial tubes and help bring up phlegm. Whole licorice root can produce serious side effects, such as raising the blood pressure. Scientists have created a substance called DGL, or deglycyrrhzinated licorice, which doesn't create these dangerous side effects and is often used to treat digestive disturbances. However, whole licorice root is still used to treat coughs and upper respiratory ailments. If you are using whole licorice root to treat coughing, be sure to consult your health practitioner before doing so, especially if you have high blood pressure or take medication that affects the blood pressure and heart. Licorice root has been a traditional remedy for sore throats, colds, coughing and bronchitis, making it especially effective when made into an herbal tea. Simply place 1 tsp. of dried herb into 2 cups water and boil for 5 minutes. Remove the mixture from the heat, and allow it to steep another 5 to 10 minutes to the strength you like. Strain out the herbs and drink. It is sweet and does not need additional sugar added. Do not add milk or cream. Drink the tea clear to soothe away throat pain and stop a tickle causing a cough. If you prefer, you can buy premade licorice root teabags at the health food store. In addition to raising the blood pressure, large amounts of whole licorice root with glycyrrhizin -- more than 20 g daily -- may increase the blood levels of aldosterone, a hormone based in the adrenal cortex that may cause headaches, cardiovascular problems and kidney disease. It may also cause heart attack, swelling of the legs and fluid retention throughout the body. Even small amounts in people who are sensitive or have heart or kidney disease can cause numbness or muscle pain in the extremities. Do not take any form of licorice root if you have heart disease, hypertension, diabetes, kidney or liver disease. Do not give licorice root to children.